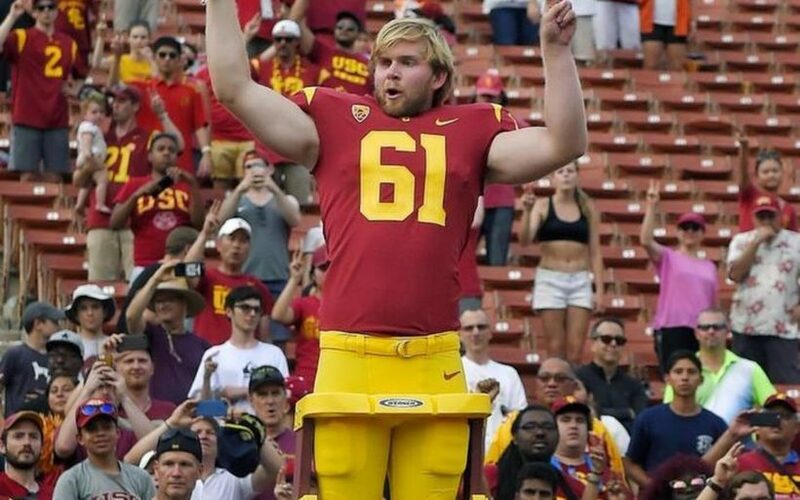 USC's long snapper Jake Olson has been blind since the age of 12. (by John Feinsein, The Washington Post) – When Jake Olson heard his coach, Clay Helton, calling his name late in Southern California’s game Saturday afternoon against Western Michigan, he was caught a little bit by surprise. Olson had been ready all week, ever since Helton had called him into his office and told him the plan was in place for the redshirt sophomore to snap the ball on an extra point in the season’s opening game. Olson had thought about it, been anxious about it, lost sleep worrying about it. He’d been nervous in pregame warm-ups thinking this was the time — finally. Olson, as much of the college-football-watching world now knows, is different from other football players, uniquely different. He has been blind since age 12, having lost both his eyes to retinal cancer. He had his left eye removed when he was 10 months old. When the cancer returned in 2009, doctors told his parents the only way to keep the it from spreading was to remove the right eye. Pete Carroll was then the coach at USC. The Olsons had a neighbor who taught at USC and they knew a number of players on the team. When word reached Carroll that there was a 12-year-old boy who had grown up loving the Trojans who was about to lose his sight, he got in touch with Jake’s parents, Brian and Cindy Olson. Carroll also arranged for the little boy to hold the traditional band leader’s sword and lead the USC band after a game. Carroll wanted Olson to see everything he could so he could carry the memories with him in his mind’s eye forever. Olson went to Notre Dame with the team, then to one last practice the night before the surgery. After Carroll left USC to coach the Seattle Seahawks, he and Olson kept in touch. In 2011 Olson traveled to a game in Seattle and was on the sideline before the game while the teams warmed up. Seahawks long snapper Clint Gresham asked if he had any interest in learning how to play the position. Olson was — is — a good athlete. He plays golf often and says he can regularly shoot in the 70s when he gets some time to play. After learning how to long-snap, he played in high school. When he got to USC his dream was to be part of the team and — someday — snap the ball in a game. 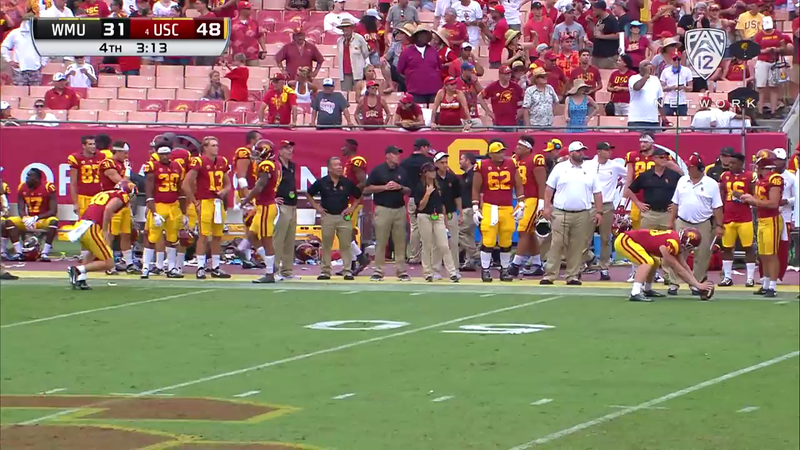 This week, with the Trojans hosting Western Michigan, Helton decided this was the time to try to get it done. He contacted Broncos Coach Tim Lester and explained the situation. Clearly, Helton couldn’t risk sending Olson into the game as if he was any other player and having a huge defensive lineman slam into him trying to block a kick. Helton and Lester agreed that USC wouldn’t rush on the Broncos’ first extra point attempt, assuming there was one. After that, all Helton had to do was let Lester know when he was sending Olson into the game. The school then contacted the NCAA and the Pacific-12 to let them know they had taken steps to ensure that Olson wouldn’t be in danger if he got into the game. After that, Olson believed all the work he’d done with holder Wyatt Schmidt was finally going to pay off. Western Michigan was 13-1 a year ago under Coach P.J. Fleck, but with Fleck now at Minnesota and his replacement, Lester, trying to fill some key holes in his lineup, fourth-ranked USC was expected to win the opener in the L.A. Coliseum with ease. It didn’t turn out that way. Western Michigan was willing to stand down on an extra point attempt but not in the game. It was 14-14 at halftime, 21-21 after three quarters and 28-28 midway through the fourth quarter. Then USC scored two lightning-fast touchdowns with the Broncos answering only with a field goal and it was 42-31. When the Trojans scored again on a pick-six with 3:13 to go, Olson heard his coach calling him. “Are you good to go?” Schmidt asked. Helton called timeout. That gave Olson a chance to take a couple of warm-up snaps — and deep breaths. There were 61,125 fans in his new office when he and Schmidt trotted onto the field. This, though, was completely different. “I think the one thing that made me nervous about the whole thing was understanding no matter how many times I told myself it was just another snap, that I knew it wasn’t,” Olson said. “It was about more than football. It was about showing people you can overcome something bad, something really awful, if you just don’t give up on yourself. The snap was perfect and Chase McGrath converted arguably the most beautiful extra point in football history. Olson was mobbed by his teammates.